AEC Systems offers a number of product lines to suit a variety of cleaning needs. We also design cleaning systems specific to certain parts. Here we feature the many different kinds of parts washers we have designed for our clients. according to our customers’ required cleanliness specifications. We can build an industrial bearing washer that is loaded by hand or via robot. Please contact us to specify what size washer and cycle time you will need. It’s our mission to design and build the most economical and efficient parts washer we can for every cleaning need. Both commercial airline and military aviation airplanes have to be routinely maintained in order to function well. This maintenance includes removing aircraft wheel hubs and cleaning off the accumulated rubber bead, bearing grease, and carbon dust according to either industry or military specification before they can be sent for rebuild. There are different ways of cleaning aircraft wheels. We designed this auto-feed aircraft wheel washer to automatically feed the wheel halves into and out of the washer by a conveyor system. The conveyors eliminate the need for the operator to lift the heavy wheel halves onto a fixture that would then be loaded into a cabinet washer. Companies concerned with ergonomics are leaning toward automatic feed systems to help keep their employees from getting hurt on the job. What is your parts washer’s load time? Is it inefficient? Does it take too much time? Why not load a dirty part while a part is being cleaned? AEC Systems can design and build a washer to meet your cycle time and cleanliness requirements. With this shuttle washer large components of construction equipment needed to be cleaned at a rate of one part every 12 minutes. This system washes, rinses, and blows off the part with a traveling manifold while the operators load or unload parts into the washer’s second fixture. The fixtures shuttle in and out of each side of the washer. AEC Systems can provide a washing or drying system that the customer feeds their parts through. In this case spooled sheet metal is fed through the rolled sheet metal washer at a rate of 225 feet per minute. To remove mill oils, the metal is washed, rinsed, and then dried. This process can be done before or after a stamping process. AEC System’s Drum Parts Washer is great for a large volume of small parts. Particularly those fed directly off of screw machines. A helix within a drum cylinder gentle turns each part as it advances through the various cleaning stages needed to meet the parts cleanliness specification. Water entrapment is not normally a problem with the Drum/Auger Type Washer as cavities are constantly being dumped of solution as they move through the washer. 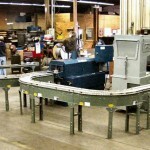 Parts can be loaded manually, by conveyor belt, or by hopper. There is minimal operator intervention from load to unload end. Liquid stages can be either spray or submersion. A Cabinet Parts Washer is an ideal washing systems for larger heavier parts that do not require high volume of parts output per hour. They come with a front loading door, top loading lid, or vertical rise door. Your choice for your need. An Aqueous-Based Cabinet Parts Washer has a revolving turntable which ensures that a part is cleaned from all sides. This turntable can be fixed in the Washer or as a swing-out table that comes out to the operator as the door is opened for loading or unloading. These Aqueous-Based Cabinet Washers can handle batch loads from 500 pounds up to 60,000 pounds all day long. Labyrinth door seals and seal-less industrial pumps make for many hours of trouble free service. Our Solvent Parts Washer is still the best and most economical way to clean for some cleaning applications. Whether it is precision made parts that must be spot free or be kept from rusting or a micron cleanliness that only a solvent can give on the part, we have multiple stage solvent washers that do the job and are also eco-friendly. With our Solvent Parts Washer, we even offer carbon filtration on the drying stage to avoid any hydro carbons escaping to the atmosphere or odors that would bring complaints from the area workers. The Top Load Washer is a great batch type Washer that can be used as a stand-alone or integrated within a work cell to clean low volume parts as they are transferred from one machining operation to the next. In the Top Loading Washer, small parts or baskets of parts can be loaded onto the turntable by hand or a heavier single part can be loaded by used of a jib crane or pick and place device. Our Dip Tank Systems (both Single and Multiple Stage Dip Tank Washer) can process your parts by using an overhead crane to manually move a load from stage to stage, automated roller platforms to move baskets of parts from stage to stage, or a PLC controlled completely automated system to control stage times and order. Also in these Single and Multiple Stage Dip Tank Washers, push-pull draft systems are available when strong chemicals must be used and venting from tanks be controlled for safety of operator and environment. The AEC Systems Aircraft Wheel Washer is a pass-through washer with and a vertical rising guillotine door. The roller conveyor system along with automatic load system assists facilities in injury free material handling along with reducing operator fatigue. This washer provides a consistent flow-through process to increase production and will run automatically even through breaks, producing a consistent level of clean with no leftover grease in bearing pockets to wipe out after washing. The wheel washer uses FAA approved aqueous technology to remove dirt, grease, rubber, carbon or particulate. Our Spray Immersion Washer is designed to combine the ability to spray and immerse parts while cleaning; rotate parts to ensure drainage of solution; and dry efficiently. Single or multiple parts baskets are loaded into a revolving fixture. As an operator presses a cycle start button, the door closes, a containment trough rotates under the parts as the wash pump starts up spraying the parts, and the cleaning fixture rotates in and out of the containment trough which constantly has the parts being submerged and then sprayed repeatedly during the cleaning cycle. The trough eventually overflows back to the solution tank to be filtered and pumped back to the spray nozzles. Multiple cleaning stages are available as well as filtering options. Do you think your production rate is too high for a cabinet-style washer? You may want to consider a cabinet washer with more than one turntable. This Four Turntable Washer has a drop-down door with 4 rotating turntables and 4 separate wash manifolds to ensure all parts are cleaned. In this washer each turntable has the capacity to hold an engine block up to 20 inches in diameter and 36 inches tall with each engine block weighing up to 500 pounds. AEC System’s Custom Parts Washer is unique in that they are designed to do a specific cleaning job on a specific part at a specific production rate, and often must fit into a specific footprint of the work cell. Give us a before and after cleaning part or a dirty part and your cleaning specifications and we will do the rest. AEC System’s Multiple Stage Conveyor Parts Washer is great for cleaning parts that are being fed from another production conveyor or even right off the back of a press. This type of washing system can have unlimited number of cleaning and drying stages to meet high volume type cleaning of parts. Open wire belting is used for lighter and smaller parts. This Compact Conveyor Parts Washer takes up a lot less real estate from your production floor than conventional Multiple Stage Conveyor Washer. It is ideal for parts that fit into a work envelope of 12” x 12” or smaller. Use the Compact Conveyor Parts Washer when you have new part cleaning, but close quarters for installing a washer. AEC Systems built this cabinet washer to clean aircraft wheels. It is constructed of heavy-duty steel with the wash tank and cabinet of the washer insulated. The advantage of having a Dual Door Cabinet Washer is that while a cleaning cycle is being run, the operator can load the second turntable with parts that need to be cleaned. Once a cleaning cycle has finished the operator then opens one door and closes the other door and presses the start button. This reduces the handling time of parts from the total cleaning time. In keeping with “green” management, many businesses are re-using their containers for product. Our Gallon Parts Washer will clean one 5-gallon pail to a 55-gallon drum at a time; inside and outside. Whether the container is open top or closed top, we have Drum/Container Washers to do either. An Industrial Dip Tank with Agitation Washer is used when parts must be submerged in order to clean internal cavities or because they need soaking time to allow the cleaning chemicals to properly work. Sometimes that part to be cleaned is so large that if the Industrial Dip Tank with Agitation Washer is mounted above floor level it stands too high to effectively load and unload parts safely. We can provide a completely automated system that can be pit mounted for floor level loading and unloading up to a 10,000 pound single object or large basket full of multiple parts. This washer can be modified to be either a single stage or multiple stage system to meet cleanliness requirements. This Industrial Cabinet Spray Washer has a part work envelope of up to 40 inches in diameter (additional sized washers are available). Its cycle time from load to unload is 10 minutes. The operator places a part or parts (here a tube) on a cleaning fixture located on a vertical driven turntable and clamps that part in place. The operator then closes the door and pushes the cycle start button, and the vertical turntable automatically starts to rotate as the wash pump starts up. There are spray nozzles located in a semi-circle outside of the diameter of the turntable that will spray the inside of the tube as it rotates, and there are additional spray nozzles that will spray the outside of the tube at the same time. Once the wash cycle has timed out and tube drains solution from both ends of the tube, a blow-off cycle will start up, drying the tube as it continues to rotate on the turntable. When the drying cycle stops, the operator opens the door, removes the clean and dried part and replaces it with another dirty part to start the cleaning cycle over again. This Mini Track Conveyor Washer was designed to clean closed end cylindrical parts. The washer can be fed by hand or directly from processing equipment such as a grinder or honing machine or by a robot/pick and place. The washer has a pneumatic cylinder that pushes the parts through the washer. The Mini Track Conveyor Washer cleans and dries the parts at a rate of one every 4.5 seconds. Rinse and rust preventative stages can be added to the washer and the cycle time is fully adjustable. We designed this Industrial Tote Cabinet Washer to clean totes that are used to hold oil, transmission fluids and brake fluid used in the auto industry and also in auto repair shops. The totes have holes in the top that ranged from 5 to 18 inches in diameter. The washer has a center pipe that descends into the tote during the cleaning cycle to spray the inside of the tote and also blow it out with heated air. AEC Systems was asked to build a Pallet Washer for a pharmaceutical manufacturer. This washer was designed to clean and dry four plastic pallets per load, each pallet measuring 44 inches by 48 inches by 6 inches. The pallet washer has a fixture on the vertical turntable that operator loads the pallets into, and the washer cleans and dries each load of totes in approximately 10 minutes. During the cleaning and drying processes the parts are rotated to ensure all surfaces of the totes are fully cleaned and dried. A Heavy Industrial Equipment Washer is designed to clean large, heavy parts, with lots of soil load – up to 60,000 pound parts and soils so heavy that we often use a sludge drag option to keep the solution bath free of debris to increase the useful life of the cleaning chemistry. These heavy equipment washers can be designed for loading with an overhead crane, by fork truck, or other material handling device. Their pumping systems range from 15 horsepower to 100 horsepower output.